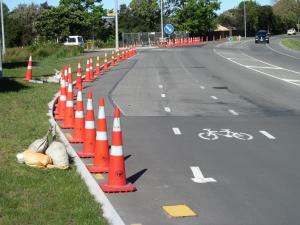 Traffic Wise have coned off the eastbound cycle lane on Prestons Rd at the intersection with Bluestone Dr. Unfortunately there is no advance warning of this closure, which forces cyclists out into the general traffic lane. To make the situation more dangerous, there is a pedestrian island in the middle of the road at this location, so vehicles have no space to safely manoeuvre around cyclists. At a minimum, an “Extreme Care Cyclists Merging” sign would alert approaching road users of the hazard ahead. Cones closing off cycle lane now removed, allowing cyclists to pass the worksite whilst staying in the cycle lane.